Otis said this week he would auction the items — which include Gandhi’s famous metal-rimmed glasses — on Thursday and donate the proceeds “to promote Gandhi’s great words and actions.” But he said the items would be donated to the Indian government if it was “willing to offer something very generous to India’s poorest in exchange.” The expected price of the items had skyrocketed to about $300,000 Wednesday, 10 times more than the estimated price on Tuesday, he added. “I will ask the Indian government if they would do a great gesture to the poorest of India, like those that we’ve all seen in ‘Slumdog Millionaire,'” Otis said, referring to the Academy Award-winning film. 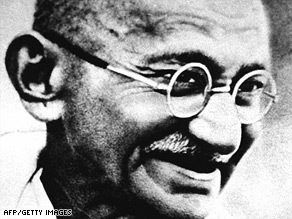 Gandhi, who waged a long struggle against British rule in India, was assassinated in New Delhi by a Hindu fanatic on January 30, 1948. He is still widely revered for his insistence on non-violent protest to achieve political and social progress. Otis said he did not fully understand the outrage over the planned auction because Gandhi was not interested in material possessions, many of his belongings are already in India’s museums, and Gandhi himself had often auctioned off gifts that he had received to raise money for the poor. The glasses are scheduled to be auctioned off at the Antiquorum auction house on New York’s Madison Avenue along with Gandhi’s pocketwatch, sandals, bowl, according to the Web site for Antiquorum, which specializes in watches. “This is a once in a lifetime opportunity and the people that want to acquire it, I think, basically will pay whatever it takes for them to get those objects” said Julien Schaerer, with Antiquorum Auctioneers. A court in New Delhi on Tuesday issued an injunction to stop the auction. India’s solicitor-general, Mohan Parasaran, said the ruling was based on a plea filed by a trust that he said cited itself as the “rightful beneficiary” of the articles under Gandhi’s will. He added that the order would be served to the auction house through the Indian consulate in New York.